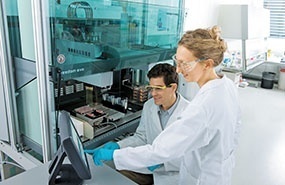 The GeT genomics facility near Toulouse has been developing a series of automated NGS protocols in collaboration with Tecan – including Illumina’s TruSeq® DNA and RNA kits, as well as Bioo Scientific’s NEXTflex™ PCR-Free Modules – on two Freedom EVO® workstations, helping to improve throughput and reliability for a wide range of projects. Monitoring the effects of environmental pollutants on live organisms is now much faster thanks to a technique developed by researchers in France, who are using an Infinite® F200 PRO microplate reader to screen aquatic model organisms. 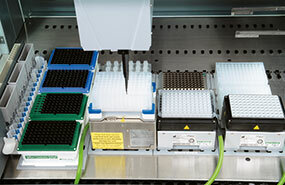 The High Throughput Omics Platform is an advanced microbial cultivation and sampling system designed to accelerate the development of novel biotechnology applications. Created as a collaboration between LISBP and the Tecan Integration Group, this unique system is being harnessed to investigate potential biofuels, biomaterials and biochemicals. A Freedom EVO® 150 is being used to full effect by scientists and doctors at the University Hospital of Padova in Italy, preparing samples for LC-MSMS to monitor immunosuppressant drugs in transplant patients. Ambry Genetics in California is taking advantage of the increased throughput, reliability and reproducibility of laboratory automation, using Freedom EVO® workstations to streamline its genetic testing workflows for cancers, cystic fibrosis and numerous inherited diseases. MLM Medical Labs is taking advantage of the Freedom EVOlyzer® workstation’s optimized ELISA processing to help meet the complex laboratory support needs of clinical trials, increasing throughput and improving process security. 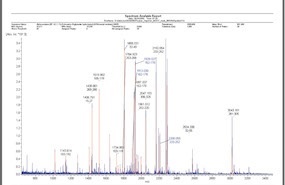 The University of North Carolina (UNC) has automated its major sample preparation protocols for next generation sequencing on a Freedom EVO® workstation, enabling more efficient processing. The Tecan UK User Meeting 2013 provided the perfect opportunity for members of the automation community to network with other users, discussing a wide array of applications. The Dako Omnis platform – developed and manufactured by Tecan – offers complete automation of both immunohistochemistry (IHC) and in situ hybridization (ISH) protocols. Tecan’s Common Notification System (CNS) is now available for the Infinite® PRO series of microplate readers, allowing users to remotely monitor the status of any Infinite reader using Magellan™ software (v7.2). Fluent is a unique automation concept built around the application-specific needs of laboratories, delivering more capacity and increased speed. Initially focusing on the complete automation of cell-based and biochemical assay workflows, Fluent brings together all the modules and devices required for automation of these assays in a single efficient and easy-to-use platform.